GCI Outdoor was founded in 1996 by Dan Grace who wondered “Why isn’t there a chair for this?” The first product was the Everywhere Chair, and the company has grown from there. They have six patents and ten more pending. They have numerous chairs for every type of situation. Their website is easy to use and clutter free. The FirePit Rocker is a low ride rocking chair that features GCI Outdoor’s patent-pending Spring-Action Rocking Technology. The chair has a fabric seat and a partial mesh and fabric backrest and padded arm rests. There is a single fabric drink holder that hangs off of the right leg of the chair. The chair folds up with GCI Outdoor’s patent-pending EAZY-FOLD technology and has a handle to make carrying the chair easier. GCI Outdoor claims that the chair will support users up to 250 pounds. The chair weighs 12 pounds and sits approximately 14 inches off of the ground. It retails for $60. This is an awesome chair. I first saw it at the Winter Outdoor Retailer show and sat in after walking all day around the convention center, and I was hooked and wanted to see how it worked in the outdoors. A couple of things stand out to me even before getting to play with it in the woods. First, the chair does sit pretty low to the ground which I like. I can stretch my legs out more easily with a low chair and it makes it easy to rock. The second thing that stands out is that the seat is extra wide. I don’t feel squished when I sit in it. It is easy to fold and carry – just pull up on the side and the chair folds up flat. So far I have found the chair to be comfortable even though I have mostly used it in the house. I will evaluate the FirePit Rocker on three main characteristics – comfort, durability and usefulness. 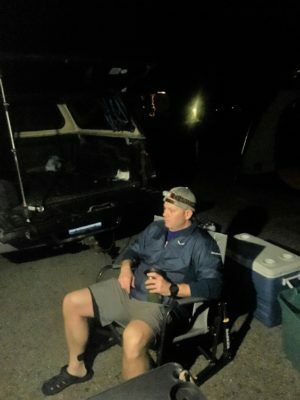 I want to know if the FirePit rocker is comfortable to sit in while camping. I want to know if I can just toss it in the back of the truck with my other gear, or do I have to baby it? Does the chair work on multiple surface types? Does the fabric cup holder actually work or is it for show? These are just a few of the questions I will seek to answer as I review the chair. 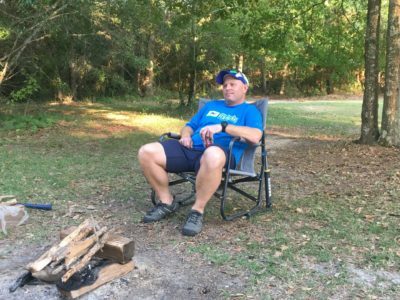 I have used the GCI Outdoors Fire Pit Rocker on a weekend camping trip to Grand Isle State Park, LA, and on four trips to Buccaneer State Park on the Mississippi Gulf Coast. In addition, I have used the chair at home when we have had folks over, and on picnics in City Park in New Orleans. Temperatures have ranged from comfortable 60s to unbearable 90s with high humidity. I have experienced some typical late afternoon thunderstorms that come with summer in the south. As I mention in my initial thoughts, I will evaluate the Fire Pit Rocker on three characteristics – comfort, durability and functionality. Comfort has been off the chart. The chair is low to the ground, so it is easy to sit in. I can extend my legs out of in front of me and gently move my legs to rock back and forth. I also like how wide the chair is. There is plenty of room to adjust and slouch in the seat. The fabric arm rests that are held in place with Velcro are more comfortable than the metal arm, but don’t provide much padding. The back of the chair is nice and wide and has just the right amount of give. The mesh back allows air through to help keep me cool. However, the mesh also opens my back to mosquito attacks. I found that draping a shirt or light jacket over the mesh keep them from biting me through the mesh. The durability of the chair seems to be good. I have not babied the chair; it rides in the back of the truck and is kept in a closet outside that is subject to the heat and humidity. There are no obvious wear spots in the fabric or mesh back. It basically still looks new. The rubber feet on the bottom of the chair show some signs of wear but nothing unexpected from multiple days and nights of use. The rocking mechanism continues to be smooth and provides a nice rocking experience. It has started to squeak some, but it has not become consistent or unbearable. All the hardware associated with the EAZY-FOLD technology is still tight as designed. The functionality of the chair is great. I have taken it everywhere I need to have a chair. It is usually the first item out of the truck when I get to camp. 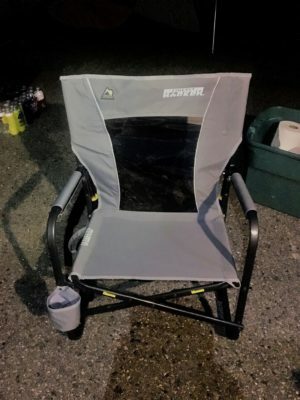 It folds down easily and I can sit down and enjoy a cold beverage before setting up camp. I have used it on grass, concrete and small rocky surfaces with no issues. I have not used it on uneven terrain yet. The fabric drink holder is adequate. It holds water bottles and metal pint style glasses easily. The fabric can be a little floppy so I recommend using cups with lids to keep your drink from spilling. The GCI Outdoors Fire Pit Rocker has performed well and is a super comfortable chair. I am a bit spoiled and not sure I can go back to a regular folding chair. This concludes my update, please check back in a month or so for my final update. 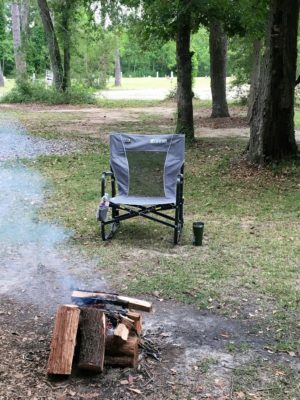 Special thanks to 4alloutdoors.org and GCI Outdoor for providing the FirePit Rocker for this review.